PERSONAL DATA: Born in Fayette, Mississippi, on November 12, 1937. Married. Three children. EDUCATION: Attended schools in Fayette and Meridian, Mississippi; received a bachelor of aeronautical engineering degree from Georgia Institute of Technology in 1959. SPECIAL HONORS: Decorations include the Defense Distinguished Service Medal, Defense Superior Service Medal, two Legion of Merit, Navy Distinguished Flying Cross, and the Meritorious Service Award. His NASA awards include the NASA Distinguished Service Medal, two NASA Space Flight Medals, and two NASA Exceptional Service Medals. He is also the recipient of the Air Force Association’s David C. Shilling Award (1978), Society of Experimental Test Pilot’s Ivan C. Kincheloe Award (1978), the American Astronautical Society’s Flight Achievement Award (1977), the American Institute of Aeronautics and Astronautics Haley Space Flight Award (1980), the Robert H. Goddard Memorial Trophy (1982), the Thomas D. White Space Trophy (1982), the Robert J. Collier Trophy (1982), the Harmon International Trophy (1982), the Federation Aeronautique Internationale Gold Space Medal (1984), the Boy Scouts of America Distinguished Eagle Scout Award , and the Medal of Honor of the National Society of the Daughters of the American Revolution.. EXPERIENCE: Truly was ordered to flight school and was designated a Naval Aviator on October 7, 1960. His initial tour of duty was in Fighter Squadron 33 where he flew F-8 Crusaders aboard USS Intrepid (CVA-11) and USS Enterprise (CVN-65) and made more than 300 carrier landings. From 1963 to 1965, he was first a student and later an instructor at the U.S. Air Force Aerospace Research Pilot School at Edwards Air Force Base, California. In 1965, he was among the first military astronauts selected to the USAF Manned Orbiting Laboratory program in Los Angeles, California. He became an astronaut for the National Aeronautics and Space Administration in August 1969. He was a member of the Astronaut support crew and capsule communicator for all three of the manned Skylab missions (1973) and the Apollo-Soyuz mission (1975). Truly was pilot for one of the two-man crews that flew the 747/Space Shuttle Enterprise approach and landing test flights during 1977. He was then assigned as a backup pilot for STS-1, the first orbital flight test of the Shuttle. His first flight into space (STS-2, November 12-14, 1981) was as pilot of the Space Shuttle Columbia, significant at the first manned spacecraft to be reflown in space. 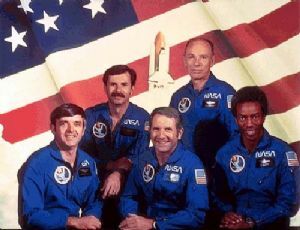 His second flight (STS-8, August 30 to September 5, 1983) was as commander of the Space Shuttle Challenger, which was the first night launch and landing in the Shuttle program. As a Naval Aviator and test pilot, Truly has over 7,000 hours in numerous military jet aircraft. Truly left NASA in 1983 to become the first commander of the Naval Space Command, Dahlgren, Virginia. He served as NASA Administrator from 1989-1992.